Fariñas, M. D., Knapik, D. S., Pina, J. J. P., Pelegrin, E. G., & Álvarez-Arenas, T. E. G. (2014). Monitoring Plant Response to Environmental Stimuli by Ultrasonic Sensing of the Leaves. Ultrasound in medicine & biology, 40(9), 2183-2194. Evolution of the thickness resonant frequency of a Vitis vinifera leaf over 3.5 days. 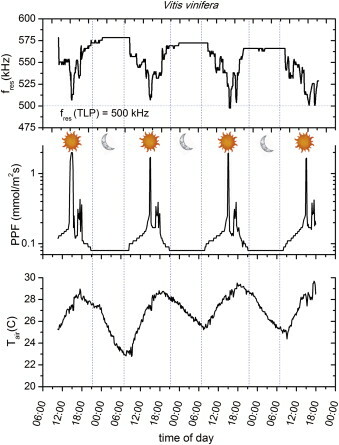 Photosynthetic photon flux (PPF) and ambient temperature measurements are also shown. This entry was posted on September 17, 2014 by M.D. Fariñas in Article, News and tagged article, Ecophysiology, leaves, monitoring, plants, ultrasounds.